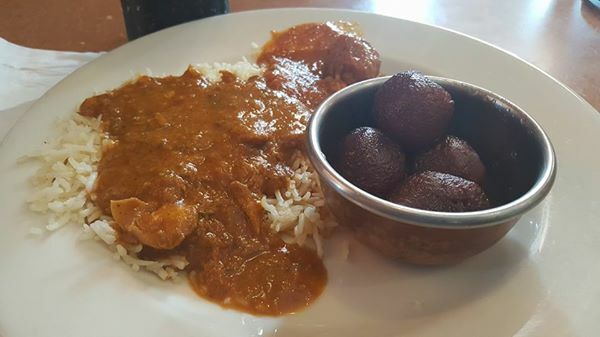 If you are looking for good Indian or Mediterranean food at a great price, Metropolis Curry and Kabob may be the place for you. I have been a patron of the restaurant since before it moved to its current location and changed its name and have always been satisfied by the quality as well as the friendliness of the owner and staff. 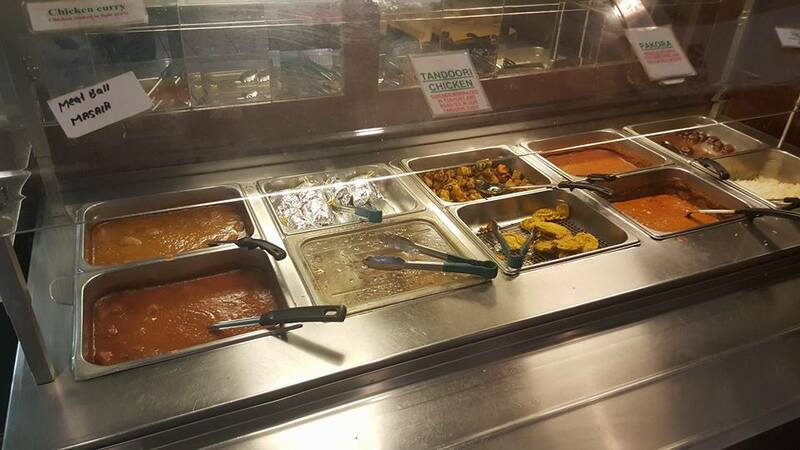 The buffet has a modest selection of entrees as well as a similar sized “salad” bar with cold items. Photo by Doug Deal. My usual meal is an “Indian hot” mixed grill, which is a selection of peppers, onions, chicken, lamb and shrimp cooked in their charcoal fired tandoori with Indian spices and served on a cast iron skillet. It pairs extremely well with rice and naan bread and can be ordered mild if you prefer. It is definitely too much for one person to eat, but it is so good that you will probably try your best. The menu also has the usual Indian favorites like saag panirr, channa masala, chicken vindalo and others. The channa masala is simply the best I have ever had and is a favorite of my wife’s. But the menu does not stop at Indian, as they also offer a wide selection of Mediterranean favorites, like kabobs, gyros, hummus, souvlaki and dolmades. There are enough options, that it becomes easy for anyone to find something they would like and is an ideal place to introduce someone to the pleasures of Indian or Mediterranean food. Metropolis Curry Chicken and gulab jamun from the buffet. Photo by Doug Deal. On this occasion, I happened to stop by during lunch and tried the $7.99 lunch buffet. The selection is not huge, but is varied enough to get a good sampling of what they have to offer. They always seem to have a tandoori chicken, a curried chicken, a couple of vegetarian options, and a few that are swapped out from day to day. This time, those two options were meatball vindaloo (not too spicy) and a chili chicken gyro. I tried a little of everything. The chicken curry was excellent. Since I was getting chunks of the tandoori chicken, I just poured the sauce over rice and ate it with naan. As with buffets, it had a more mild heat, but the flavor was not sacrificed in the least. I got seconds. I am a fan of a regular beef and lamb gyro, but the chicken chili version was interesting and delicious. You could really taste the spice, but it wasn’t overpowering. The meatball dish was unique, because you do not generally find such meat pairings with a vindaloo curry. It was good, but I give the edge to the chicken curry. 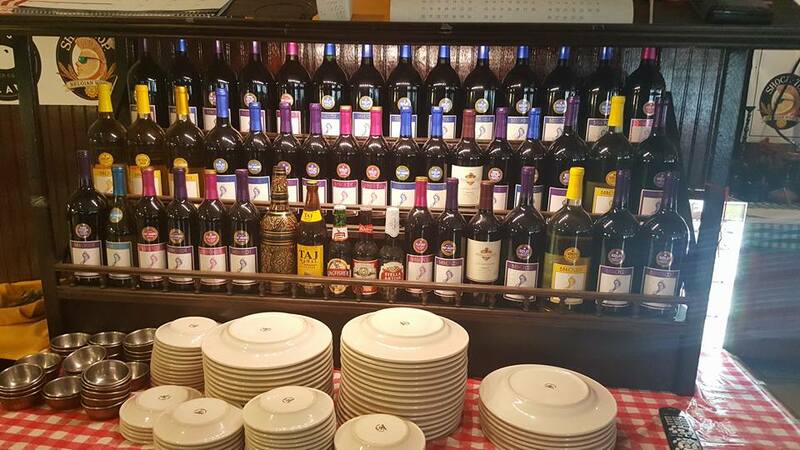 Metropolis also offers a large selections of wines. Photo by Doug Deal. The vegetable dish I tried was the navritan korma which is a mixture of various vegetables in a tomato cream sauce, seasoned with the usual Indian spices of coriander, turmeric and garam masala. Also delicious with naan and rice. The highlight of the experience is the desert, gulab jumin, which are spongy milky balls soaked in a sweet syrup. My kids crave them and their eyes light up when you bring them back to the table. Metropolis Curry and Kabob is a nice place to grab some Indian, Mediterranean or a combo of the two. I normally order off the menu, but the buffet is of good quality as well, but served mild, so if you are looking for spicier entrees, order off the menu. The price is extremely reasonable and the staff will do their best to make you happy.